Stuntman Lutz Duda (with a name like Lutz, he's got to be a badass) provided a demonstration of the protective capabilities built in to the Uvex RS3 fire suit. How? He built a raging fire, put on the RS3 and then sat down in the middle of the fire. At half the weight of the average fire suit, the RS3 meets FIA requirements for protection from 850 degree temps for 35 seconds while allowing for weight in other areas of the race car. We don't know what exactly Duda said ahead of this stunt, but we expect it started out with "Hey guys, watch this!" Release below the jump. Just 1,100 grams between the racing driver and a blazing inferno Stuntman Lutz Duda tries out the uvex Racing Suit Petrol is highly combustible and full of energy – when used in an engine which means that racing cars weighing hundreds of kilos can accelerate to speeds in excess of 300 km/h in a matter of seconds. However, on the flip side, the experts including the uvex carRacing team, who specialise in racing equipment, know that in the case of an accident, the same energy in petrol can unleash itself against the driver, causing a blazing inferno within a fraction of a second. A single litre of petrol is enough to generate 9.61 kilowatt-hours of energy - which is equivalent to five ovens set at maximum! Emergency rescue teams can get to a burning vehicle very quickly on the racetrack, but the driver still has to rely on the protective properties of the fireproof equipment they are wearing until the fire has been safely extinguished. The uvex Racing Suit rs 3 not only has FIA certification – it also weighs a mere 1.1 kilos, which is close to half the weight of most comparable racing suits. Even at this low weight, the Racing Suit rs 3 manufactured by the highly experienced Fürth-based company, uvex, boasts impressive protective properties, as demonstrated in the 'hot stunt' performed by uvex carRacing at the IKmedia Experience Days in June. The fire built specifically for the purpose is blazing with meter-high flames as stuntman Lutz Duda steps out in front of the assembled journalists in his black uvex Racing Suit rs 3 and an fp 2 H.A.N.S carbon helmet. The roaring flames are reflected in the helmet's visor! "There's a huge difference between simply reading the word 'fireproof' or 'flame-retardant' somewhere and actually finding yourself confronted with a wall of fire," explains Simon Sirries, Key Account Manager with uvex carRacing. "The heat given off by a blaze is immense, even from several meters away." While people standing nearby take a step back, Lutz Duda bravely walks into the flames. In addition to the racing suit and helmet, he is protected by suitable underwear, shoes and gloves made by uvex – a perfect modular system that complies with all the latest FIA norms and, what's more, offers perfect body climate and wearer comfort. With bated breath, the onlookers start to count the seconds until Lutz Duda steps back out of the flames. Instead, he sits down in the very heart of the fire, before standing up and walking calmly from the inferno - entirely unscathed. "It was certainly fairly warm in the fire", says the stuntman afterwards in summary. Unlike the shiny, silver fireproof suits worn by firefighters, racing equipment isn't metallic and therefore does not reflect the heat as well, but the racing suit, which is coated with NOMEX® fibres, does its job brilliantly. 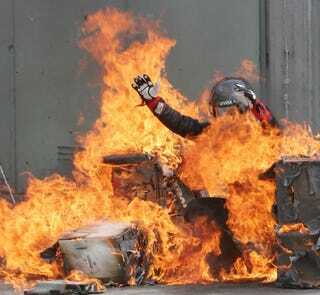 In an emergency, it is able to protect a racing driver from burns for at least 35 seconds, even at a temperature of 850 degrees. uvex has acquired decades of experience in this field through its development of industrial safety wear, for example for blast furnaces and other dangerous scenarios.